Compatibility: Compatible with all watches (including traditional and smart watches) which use 24mm standard width spring bars. Please choose the proper size for your watch. Use a metric ruler to measure the width of the connecting part where the band attached to the watch. Please refer to the Pic about how to measure. Fits: Fits most traditional and smart watches that use 24mm spring bars. Easy on/off: Quick release pin for easy band replacement in seconds, while most people can do this with their fingers. Friendly Tips: Please measure your wrist before placing order, this wrist band fits wrist circumference: 24mm bands are 3.15" x 4.92" (8.07" total length). 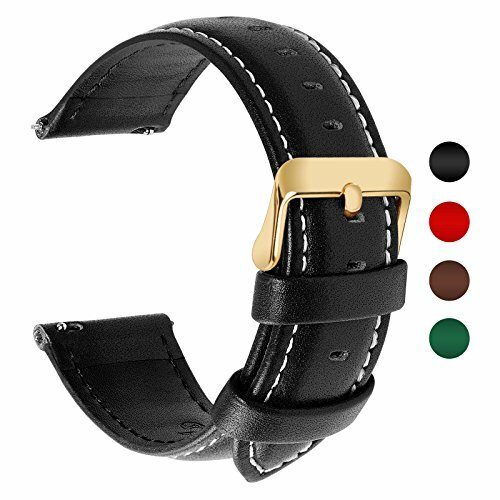 Multiple Styles: Premium soft top genuine leather strap with fashionable craftsmanship, there are 3 kinds of new stylish designs, come with 316 stainless steel polished gold buckle, C-shaped or Square, anti-slip & sweat-absorbent. Select Proper Width: 24mm watch band is compatible with all traditional and smart watches that uses 24mm spring bars. Measure the width of the connecting part where the band attached to the watch before ordering. For specific compatibility details, please refer to the "Product Description". Fashion & Classic Design: Fullmosa 24mm leather watch strap comes with gold buckle, seamless stitching making watch band more durable, and 2 cross-stitched collars to ensure secure fit. The leather watch band suits well with business and casual occasions, it will never go out of fashion. Quick & Easy: Quick release pin allows you easily swap the watch straps from your watch only by your fingers, convenient and fast, while we also provide an extra assistant tool to meet your needs. Top Service: Please ensure you choose "Sold by Fullmosa" for guaranteed quality. We are the ONLY authorized retailer of our watch brands. If you have any problems with your order please contact us for prompt and courteous service. Our contact information can be found on the every genuine Fullmosa box.